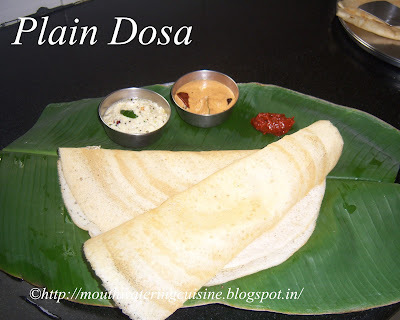 Plain dosa or dosa is a very simple and tasty South Indian breakfast recipe. It is available in every corner of South India. 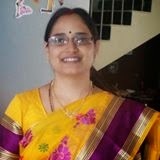 There different varieties of dosas, like plain dosa, onion dosa, masala dosa, paper dosa, steam dosa and the list goes on. The basic ingredients in dosa making are rice and black gram. The dosa batter is prepared a day before making of it. So we need to plan ahead to make this kind of dosa. We can make instant dosas also that is totally different. Dosa making depends on batter and its fermentation. To get more crispier and colored dosa add poha or flattened rice. Adding fenugreek seeds also give little crispiness to dosa. Softness of dosa depends on fermentation, to get soft and lot of holes on dosa we need to ferment it for at least five to eight hours. Holes on dosas gives a kind of nice look to them. We can store the batter in the refrigerator for two days. Wash and soak black gram, rice and fenugreek seeds for 4 hours. We can soak them separately or combining. Grind them altogether to make a smooth batter. I have table top wet grinder to grind it, but even if it is not also we can grind them in mixer grinder. While grinding add little water, approximately 1/2 cup to 1 cup. Mix it while grinding. Use a plastic spatula to mix it. Grind it till we get bubbles in the batter. We can check it with the plastic spatula. If using mixer grinder also grind till bubbles found in the batter. Remove from the grinder tin and keep it for fermentation. Add salt and mix well. The batter should be in thick form. Once it get fermented it looses automatically. Heat dosa pan, sprinkle some water to check hotness of the pan. Spread a ladle full of batter in circular motion on it. Pour one teaspoon full oil on it. Cook till it gets light brown color. Flip it and cook on the other side. Serve plain dosa with groundnut chutney, coconut chutney and any pickle.